Submitted For Your Approval… The Gun Owners Responsibility Act (GORA) of 2013! I’ve defended our right to keep and bear arms, now it’s your turn to make sure your right does not infringe on mine to exist. I suppose I should get this idea out there before all the gun control interest wanes and Sandy Hook becomes just another tragic footnote in American history. Like many thousands of bloggers, I have certainly done my share in keeping interest moving along, although I might find the arguments on both sides a bit.. misdirected… I understand the spirit. I’ve pointed out my reasons in the few posts I’ve made thus far and I’m not going to bang away at it here. But let’s try this one on for size. Realizing that I am sorta now crossing some line where I am actually taking a solid position one way or the other and likely this post might garner some “enthusiastic” opinions from others, I should make a few things clear up front about my personal demographics. I am white. (why that should make any difference one way or the other.. who knows. At least I am not green). As of this year I am now old enough to further contribute to the bankruptcy of the Social Security system (that’s been going bankrupt since I was born). I have a college degree (for what that’s worth these days). I am employed (and that’s all it is). The doc says I am overweight and unless I change my ways my lush, full, and productive life will be shortened by some unspecified time. I used to own many guns, typically I like military-style weapons. My interest in guns has little to due with having some insurance against an invading country, a renegade government, or zombies; I like shooting at things and seeing things blow up cause it’s cool. I am not a hunter; I am a “recreational” shooter. I do not currently own any guns due to economic reasons (not for any lack of interest). I am a past member of the NRA (and that’s not the “National Restaurant Association”); having joined pretty much for the magazine articles about guns (ok, ok.. and the pictures, too). I view my political affiliation as more being that of a liberal conservative. (Yes, it’s true. I can be bi-partisan; I can swing both ways). I believe the Second Amendment is as important as all the others in the list of ten. I am a military veteran of the Viet Nam era (but not a combat veteran). In spite of everything above… I am really an okay guy (I don’t much enjoy walks in the rain, I’m not overly thrilled about Monday mornings (other than waking up and finding myself still alive), and I am fine leaving the future of the shrinking rainforests to future generations. Now.. let’s move on here. Understanding that the right to bear arms is one of the ten Bill of Rights that express our freedom as a nation, my “Act” here carries that spirit forward. While we universally acknowledge gun ownership we should also acknowledge gun ownership responsibility. This means, each and every gun owner should be obligated in accepting responsibility for their firearms in the area of gun operations safety, gun storage safety, and gun education in general. Each and every gun owner should always be aware of how their firearms are being used, who uses them, and who has access to them, at all times. 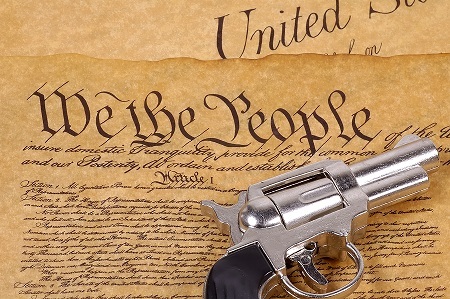 While the Second Amendment gives us the right to gun ownership, by extension it also assigns the responsibility of the gun owner to assure the personal rights of others are not violated in the use of their firearms. Given that irresponsibile use of firearms, either by owners or other persons, can cause injury, death or a threat to public safety (armed robbery and assault), many times on a wide scale, this act would serve as the attempt to assign punitive consequences to gun owners themselves, irregardless of their own guilt or innocense in the commission of those acts, whose registered or unregistered firearms were used in the commission of such crimes. These damages would be over and beyond that which is already prescribed by law, civil or criminal, federal or state or municipal. Again.. the spirit of this act is not to punish a gun owner for the crime commited using his/her firearm but rather to levy responsibility for a firearm being made available to be used in a crime. It is assumed (for this “act”) that firearm ownship carries with it sole responsibility for its use. Forfeiture of the firearm. Mandatory in all cases of criminal activity with the use of a firearm. The weapon would be destroyed or held for the judicial process as deemed appropriate. Public service. This would be mandatory, based on a multiplier of hours determined by the judicial system (but a minimum of ten hours), times the number of victims injured or killed. In the event of the firearm being used in a crime that does not afford a victim to be injured or death, an amount of hours spent would be determined by the judicial system depending on the severity of the crime and circumstances of the firearm owner. 26 victims x 10 hours (min mandatory) = 260 public service hours. Just what does this “act” serve to accomplish? It assigns social importance and moral acceptance that firearm ownership does not stop simply because the owner is not around, or has failed to establish safety precautions beyond the scope of themselves. It places a real value (loss of the firearm in question), a financial value (financial penalty based on number of victims), and a personal value (public service based on number of victims) to those owners who fail to assume responsibility of gun ownership to the level that it does not infringe on the rights of others. Hopefully it provides incentive to gun owners everywhere that there are standards of responsibility if you choose to activate the Second Amendment. It does not assign real guilt regarding the use of their firearm in a crime yet it assigns a measure of moral guilt for a failure to act responsibly in gun ownership. Unless otherwise revealed in a court of law, the gun owner is not guilty of a crime.. but of neglect. This act should not be interpreted as criminal or even a misdemenor in it’s application. The goal is to set a standard of gun ownership responsibility as part of an overall effort of a deterence to gun violence. It does nothing toward the elimination or control of gun ownership and it punishes no one for gun ownership. Would this pass the Sandy Hook litmus test? In other words, if this act were inacted would this have been an adquate deterrent to the tragedy at Sandy Hook? All anyone can guess is that it was possible. We know the killer’s mother had taught him use of weapons and likely what she knew of basic gun safety. Had something like this act been around at those times perhaps the added incentive of risk responsibility may have prevailed enough for her to think that maybe her mentally challenged son could be a greater risk factor in handling firearms given she could suffer some loss if he did anything. All fiction aside, this little exercise is to get folks thinking a bit that a law like this or similar, when used as a tool inside a broader application of mental health requirements, firearm registration, buyer background databases, and rules for gun ownership, could be effective. It can serve as a template; change the math, modify the money amounts.. whatever. The point to all this is that if you own a gun then you MUST accept responsibility for it… even when you aren’t around. This entry was posted in Current Events, Politics, Social Unrest, Social Upheaval and tagged Gun control, List of countries by gun ownership, National Restaurant Association, National Rifle Association, Right to keep and bear arms, Sandy Hook, Second Amendment to the United States Constitution, United States. Bookmark the permalink. Simply because people won’t follow the law against murder we must make more laws that can be ignored. I’m missing how layers of laws will make people abide by the law that makes up the bottom layer. I fully sense your frustration, Cuttie. Unfortunately being human isn’t equal, even though we like equality in our laws. An imperfect species we are. You’re pretty much correct in that any form of my “act” would not likely have saved anyone at Sandy Hook… although, as I indicated in my post, if there had been such a law in place there could have been a slight possibility that his mother, the gun owner, might have taken a second thought about her son’s ready access to the gun collection given his established mental state. Then again, maybe not. But my suggestion is not meant to be a panacea for eliminating all random violence in the country. It’s a tool for enhanced ownership responsibility. Actually, as you, I favor more along the lines of mental illness research in the long term of all this because even if by some fluke everyone in the country surrenders their weapons there will still be extreme cases of mental illness that will go untreated. But that is going to take years and many tests in the courts to determine setting limits on personal freedoms because of mental illness. Many of these mentally ill people shouldn’t even be allowed near an automobile, but they are. And when I referred to the mentally ill, it was to the ones being treated. Those being treated are more likely to hurt themselves or others. Also, many of the children receiving these SRIs are simple school children that like to talk too much in class. When these same kids graduate they often can no longer can get the SRIs and then become psychotic because they are no longer taking drugs to which their minds and bodies had become addicted. They then turn to illegal drugs and alcohol. My problem with your piece, and the left in general, is their first reaction to any gun event is to pass new laws, or place more restrictions on Americans. As for your responsibility act, civil laws already take care of those legalities. We already have tens of thousands of gun laws. One more law doesn’t solve the problem. More laws simply fill the already crowded courts and prisons. Laws have proven to not be preventative medicine. I want to add; we can’t have different liberties for different Americans. We cannot put the government, doctors, or parents in the position of trying to predict which people might commit crimes. We can’t imprison people because they might commit a crime. Once someone commits the crime then we can deal with them under current law. Far more people die from car accidents, falls in the bathroom, than die from gun violence. There is simply an over reaction because the object is a gun. SRI’s are drugs like Prozac. You ask for my plan? I have no plan. I do know the mental health care in this country is a disaster. I’m not an expert in this field, but have life experiences. I know while leading the safety committee at work I was required after every accident to come up with a means of preventing its re-occurrence. Solutions rarely prevented another accident, but it made the government happy. One more guard rail, one more line on the floor. 90% of the time it was just a waste of time and money. There is no way to end random violence. There are ways to lessen random violence, but that might be as simple as parents acting like parents instead of best friends. You rarely see these mass events in rural areas. This is because in rural areas parents still act like parents. Parents aren’t too busy to talk with their children. In the end, these incidents are so rare they become unimportant in the scheme of things. Some states have armed guards in schools just like they do in hospitals, banks, or corporate towers. Ohhh.. ok. I understand. So what you are suggesting is that the problem is as simple as improving general security at places where random violence can occur.. like malls, school, etc., and that the numbers compared to other forms of death does not make a problem at all. That the laws currently on the books should be enough if enforced as they should be; that attacking mental health issues surrounding gun ownership just serves to place vague limits and stigma on a portion of the population; and that gun control, again by the numbers, is not worth all the hub-bub. Hmmm… actually that’s certainly a valid, albeit unpopular, opinion. I can respect that and there’s a certain logic to it. But while us humans appreciate logic in defining our envirnment we defy logic because we are human. A complex issue in itself. I appreciate your replies. There are thousands of laws controlling and banning a long list of drugs. Within the next hour I can go purchase any number of them. Access to banned items has never been a problem even for the most restricted society. Would rather see the points you list enacted voluntarily as ‘best practices’ (perhaps put forward into action by gun groups themselves) without codification in law… but, GREAT overview and initiatives—I see them as INCENTIVES for people to keep up very very rigorous safety practices! HaHa, sorry, I am on little sleep and meant to address the Public Service Hours aspect in terms of perhaps re-allocating it to PREVENTATIVE gun safety training. I.E. Gun clubs getting together and organizing training above and beyond what is currently offered or required to be licensed. Like really making it a big, scalable campaign. Simply in order to address the heightened need for an overabundance of caution and care with regard to firearms in practice. For punishment purposes obviously as you mention that would need to be handed down by law 😉 A nice partnership of deterrents and incentives alike is probably most likely to win the day!